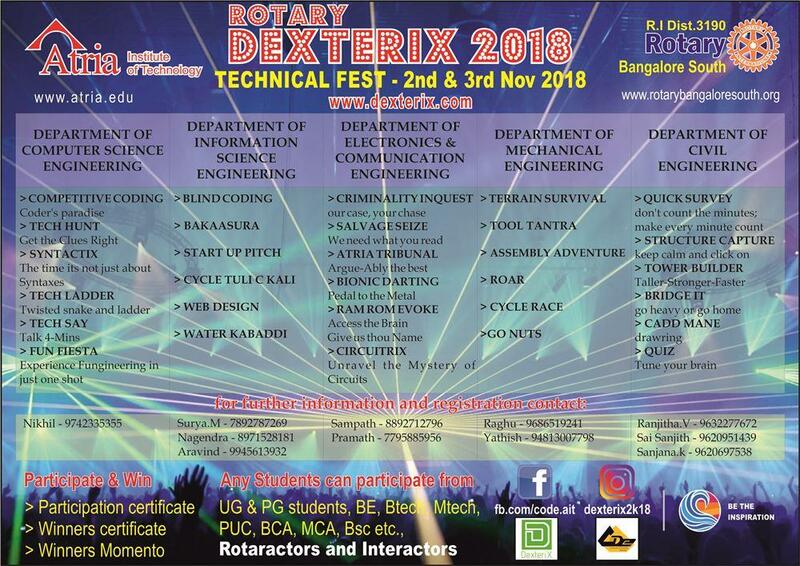 Rotary Bangalore south sponsored to conducted Dexterix-Technical fest on 2nd & 3rd Nov 2018., conducted 32 events of technical Inter college competition to college students at Atria Institute of Technology, Bengaluru. Thanks to RBS and Rtn.Venugopal, Rtn.Shivaram, Rtn.MSJ Aradhya for sponsoring the event. Special trophy designed and presented to all the winners and runners along with certificates. The Students have enjoyed the competition while learning technology. Rtn.Satish.HR planted the tree in the campus.